The color of honey changes with the summer and the bees available nectar sources. If you look at the jar on the left it is lighter in color. The jar on the right was collected a couple of days ago and notice the color, more darker and also a little bit thicker too! Even the taste ranges as well. I am really looking forward to the early September final harvest to see what color it is! Hello, came across your blog and must say I enjoyed the farm very much. Love the lamb pictures,and the other animal ones. 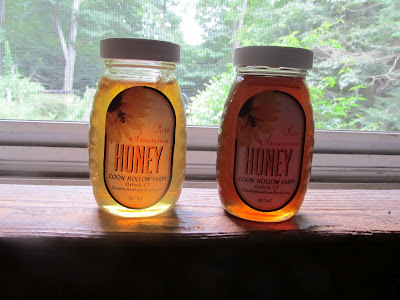 Honey looks yummy, Blessings Francine.